by Members record not found. Coelacanths ("SEE-la-kanth") are an ancient species of fish that up until 1938 were thought to have become extinct about 70 million years ago. In December of that year a fishing boat off the eastern coast of South Africa captured a living coelacanth. (At left, South Africa ,1989 Scott #762). 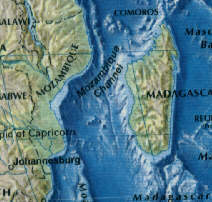 In recent years, more specimens have been found, all near the Comoro Islands between southeastern Africa and Madagascar. Researchers also found that the inhabitants of the islands had for many years used coelacanths as food, preparing the meat by drying and salting it. It is thought that the coelacanths share a common ancestor with the lungfish and the land vertebrates. The coelacanths are, however, a specialized branch of this group that has remained practically unchanged since its beginnings. For this reason the modern coelacanth is usually called a living fossil. Fossils found in many parts of the world indicate that, during their long history, various types of coelacanths, ranging in size from 15 to 152 cm (6 to 60 in), inhabited lakes, swamps, inland seas, and oceans.